It's that time again for Girl Scout Cookies! 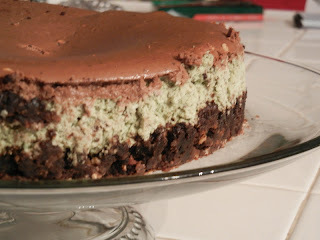 I wanted to repost this Thin Mint cheesecake recipe from last year as a little reminder to support your neighborhood Girl Scouts and give you a decadent dessert recipe to share those little cookies for a special occasion...like Valentine's Day. Place a sheet cake pan on middle rack of oven and preheat oven 475 F.
Wrap exterior of spring form pan with foil. Combine finely ground almonds, coarsely ground Thin Mint Girl Scout Cookies (minus ½ c.), and mini Oreo's. Work melted butter into dry mixture. Press mixture into bottom and up sides of 10” round spring form pan. Combine softened cream cheese, sugar, reserved (1/2 c.) finely ground thin mints, Schnapps and vanilla. Beat with electric mixer until smooth. Add eggs one at a time while stirring slowly. Reserve 1 cup of batter, and pour the rest of the batter into the prepared crust. Return the cup of batter to the mixing bowl and add chopped Andes mints and hot fudge. Mix until well blended. Pour layer over batter in spring form pan. 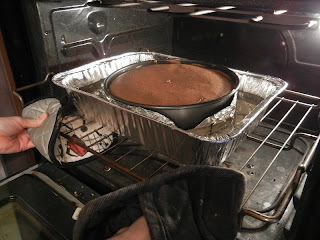 Add water to sheet cake pan. Place spring form pan in water bath. Bake 12 minutes at 475 F, then turn down to 350 F and cook for about 50 minutes. Time will vary depending on oven. Remove. Cool. Chill in refrigerator over night. Melt Andes mints. Stir into hot fudge and Schnapps. Drizzle over individual slices to garnish.